We all learned at a very young age that even numbers split nicely and odd numbers create those troublesome leftovers, remainders. For some, that thought alone is the only seed needed to sprout an appreciation for optimal knitting design layout. For others, while the math might be easy, visualizing the concept’s application to knitting design can be difficult. Read through this article, ponder the diagrams and, if the layout of Fair Isle or Norwegian knitting motifs has confounded you in the past, hopefully, this will help. As one gets into any type of stranded knitting, one learns that motifs can be lined up, shifted around, staggered, split, reflected and, indeed, transmogrified in countless ways to create an endless variety of enchanting designs. So I guess I shouldn’t be too surprised by the many e-mails I’ve received from readers in response to my post about sticking with an even number of repeats (and thereby limiting the sizes available) for my Rosy Outlook Vest design. 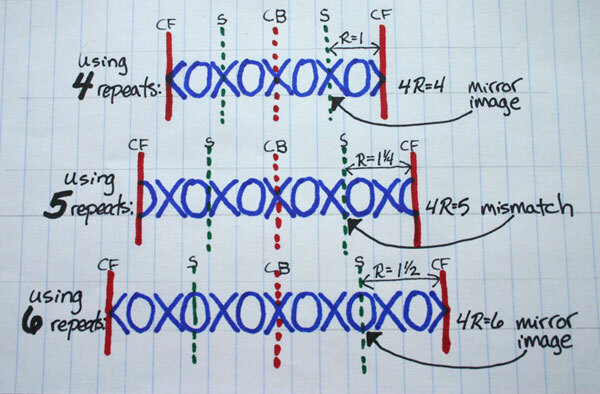 Folks have written to tell me, some quite adamantly, that I’m wrong, that one need not be limited by an even number of motif repeats, that as long as the motifs are shifted over a bit, they’ll still produce a perfectly symmetrical Fair Isle design, whether the number of motifs is even or odd. Then again, although I’m not inclined to use it (for reasons you’ll soon discover) there might be a wee bit of leeway for allowing odd-numbered repeats, in one special case. Whether or not you’ll choose to use it will depend upon your own take on “perfection” and “symmetry”. There’s an interesting article on symmetry on Wikipedia. It discusses both the aesthetic and mathematical meanings of symmetry, both of which are important in knitting design. Aesthetic symmetry focuses on the visceral sense of balance in a design, allowing for artistic preference, while the more clear-cut mathematical sense of symmetry demands mirror images and leaves little room for argument. 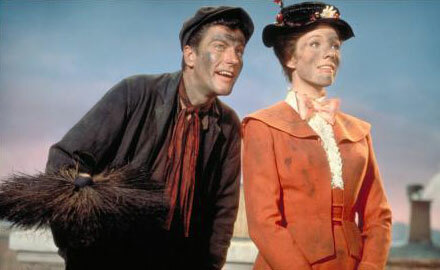 For my all-time favorite exemplar of perfection, I give you the great Mary Poppins who, as we all know, was “practically perfect in every way”. You can start the design with either a whole X or a whole O, or you can shift it a bit and start with half of an X or half of an O. My Rosy Outlook design is a variant of the 2nd, staggered layout with a shifted starting point so that we begin and end with half O’s and half X’s. Despite the “OXO” name, the repeat actually consists of either “OX” (or “XO”) and it can be measured from the beginning of an O (or X) to the start of the next instance of O (or X), or from the middle of an O (or X) to the middle of the next instance of O (or X). In either layout, the horizontal sequence is the same: …one O, one X, one O…or …one X, one O, one X; who starts first is irrelevant. In fact, the Xs and Os are irrelevant, too. You could have an *#* design with an *# repeat, or a tree-wombat-tree design with a wombat-tree repeat. (Say, there’s an idea!) You get the picture, yes? The confusing point for many seems to be: Just how many – oh, let’s just call them “XO repeats” – can you use and still produce a symmetrical design? This question often arises when the size a knitter desires lies between or beyond the sizes offered in a pattern. If a pattern has 2 sizes that differ by two repeats, why can’t we just shift things over a bit, fit in one more repeat and end up with just the right middle size in the very same design? And with all the beautiful knitters to be found in every conceivable size, why on Earth would anyone offer a design in only one size? If you’re only concerned with achieving an aesthetically symmetrical design AND your take on “practically perfect” emphasizes “practically” over “perfect”, as I mentioned, there is a bit of room, and I mean just one teeny, tiny bit of room, in a very limited number of applications, for an odd number of repeats. For instance, if you’re knitting motifs go around the bottom of your sweater or vest, but end before they get anywhere near the top, you might not really need to bother with striving for the ultimate in symmetry. In such a case, as long as you center either an X or an O at the center back and the center front, you might be perfectly happy. So, in this simplified layout, above, we have a total of 5 repeats going around our sweater, with the X centered on the front and the O centered on the back. What’s wrong with that? Granted, it’s not mathematically symmetrical, for the front and the back obviously differ. But, certainly, there is a fine sense of balance and aesthetic symmetry here, for we do have mirror images around the center front and the center back. If it’s just going around the bottom of your sweater and it ends before the armholes, there’s really nothing wrong with this layout at all. However, once you get into the armholes with an odd number of repeats, you’re headed for trouble. The thing is, to have an OXO design that is centered at the front, back and on the sides, the only way to do it is with an even number of repeats. 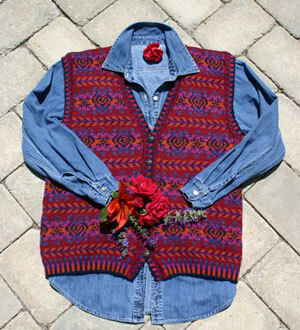 Think of my Rosy Outlook Vest, or any other OXO garment, opened in the front and laid flat. Now check out the diagram, above. Each of these cases shows an OXO example that has been centered over both the front and the back. The solid red lines at either end of each case represent the center front (CF) closures. The dotted red line down the middle of each case represents the center back (CB). The dotted green lines at the midpoint between the center back and center front represent the armhole / side lines (S) of the garment. These vertical lines mark off the four sections which represent the left front, left back, right back and right front of a garment. The variable R represents the # of XO repeats across one of those 4 sections. Unless you’re knitting for Quasimoto, you definitely want those 4 sections, and their corresponding R values, to be equal. 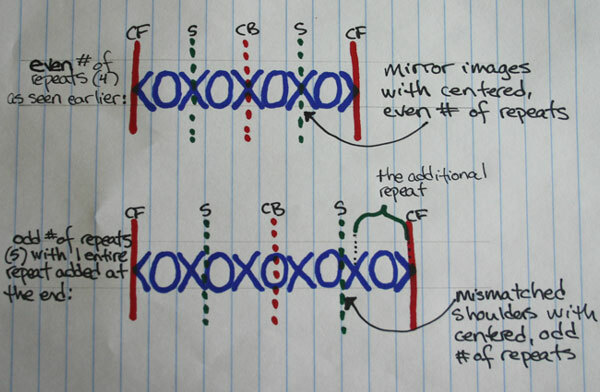 The uppermost example shows you a simplified 4-repeat OXO layout which is symmetrical around CF, CB and S. As you can see, between each of its equidistant vertical lines, we have one full repeat (2 half X’s = 1 X, and there’s 1 O), and around every vertical line drawn, the motifs form those beloved mirror images. In the middle case, I’ve added one more repeat, or more precisely, half of a repeat to each end, to get an odd-numbered repeat OXO design, as so many of my e-mailing friends have been suggesting I do. What happens now? We can still center the motifs at the center back and center front. We can still draw the vertical lines so that every section between them has the same number of repeats (R = 1 ¼, in this case) so we know our design is evenly distributed. So what’s wrong? Look at the S lines. You won’t have that nice mirror image around your armholes. Granted, I’m sure some of you are saying not only is that not the worst thing in the world, it may be the last thing in the world you’re apt to care about. I have to admit that, knitting efficacy aside, it’s probably better not to get too fixated upon other’s armholes. 😉 But let your imagination travel a bit further up the armholes to the shoulder joins. Here is a great example of what happens when one trades mathematical symmetry in knitting design in favor of squeezing in more sizes. That’s the great Alice Starmore’s wonderful Oregon Autumn design which was reprised in six, count ‘em, six sizes in the Holiday 2007 edition of Vogue Knitting. Each consecutive size has one more repeat than the last, so we know that 3 of them have an even number of repeats, and 3 of them have an odd number of repeats. Uh oh! In my first diagram, Fig. 1, I showed you what happens when you add an extra repeat to an even numbered OXO design by keeping things centered on the same motif elements, but you add one more repeat, or more specifically, half of a repeat, to each end. The resulting odd number of repeats gives us mismatched shoulders. Fig. 2, above, shows you the problem with the odd-numbered repeat sizes (every other size) in the Vogue version of Alice Starmore’s Oregon Autumn. Here, rather than keeping the centers on the same spot by splitting the extra repeat at the ends, one whole repeat is just added at one end. 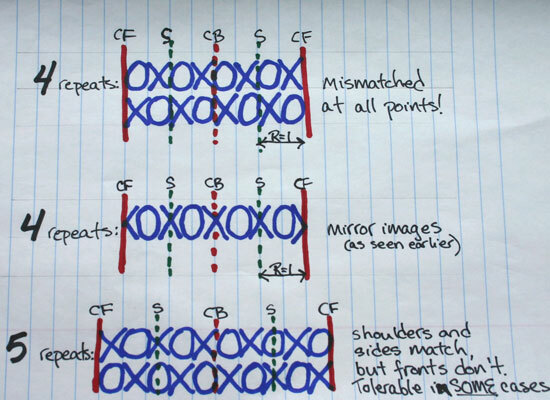 In either case, the odd number of repeats results in the same problem: whether you shift or split your added repeat, if the rest of the design is centered on the front and back, using an odd total number of repeats will always lead to mismatched shoulders. I can’t imagine there’s anyone in the world better schooled in Fair Isle design than AS. I also can’t image that, with such a popular design, any magazine editor would want the flood of disgruntled readers that would ensue if they’d didn’t offer such a masterpiece in their entire readership’s range of sizes. Hence the dilemma. Some people might not mind mismatched shoulders. Perhaps they think it’s a small price to pay to have the pattern in their size. For some of us, the design imperatives that limit the perfect result outweigh the marketing goals of offering everyone’s size. Personally, I’d be mad as a hatter if I put all of that time into knitting such a complicated design, only to have mismatched shoulders. I’m not comfortable with expecting others to do it, either. None of us is perfect, but why not shoot for perfection in our work, and come as close as we can? The magazines understandably prefer to offer the full readership’s range of sizes, even if not all of those sizes are created equally. For me, it pays to be on the internet and independent, so I can happily offer my even-numbered repeat designs, despite their limited range of sizes, without compromise. For you, before you delve into any OXO pattern, I think it will pay to grab some paper and pencil, scribble out your Xs and Os, chop up your four sections and find out just how symmetrical that design you’re thinking of spending so much time and money on really is. So what can be done for those who would dearly love to knit Oregon Autumn, or Rosy Outlook, or any other Fair Isle design, but the even-numbered repeat patterns don’t come in their size and they rightly insist upon matching shoulders? Try swatching to see if you can knit the motifs a bit more tightly to get a smaller size, or a bit more loosely to get a larger size. Or try using a different gauge of yarn. You might have to lengthen or shorten the design by a motif or so, but you can do that and still keep the other design imperatives intact. The top case shows a staggered OXO design using 4 repeats. Although it uses an even number of repeats, there’s a problem. The problem is, it has not been centered, so we have mismatches all over the place. Some folks might put this around just the bottom of a sweater and it would certainly be passable. But I’d rather see even that centered, as it was in the first diagram. Just shifting it ¼ of a repeat would do the trick, as we see in the middle case here (which is the first case from the first diagram). The bottom case shows the one rare case in which I’d use an odd number of repeats, with some important caveats. As you can see, the repeats are vertically staggered. I wouldn’t do this without vertically staggering the motifs, for, as you can see, since it’s not centered, we have O’s and X’s opposing each other all the way up the center front. As long as you vertically stagger motifs, and as long as there are plenty of rows in which the staggered effect goes back and forth, to visually distribute the motifs, I think the overall effect, while not mathematically symmetrical, is arguably aesthetically symmetrical, and it could work. 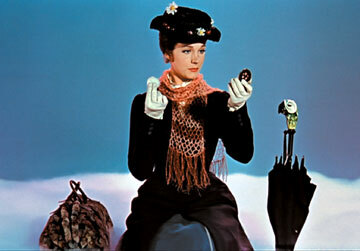 As I prove daily in so many ways, there is joy to be found in being not-quite-so-practically perfect! So why didn’t I do that in my Rosy Outlook design? I had my reasons – two, in fact. First of all, notice that the “O”s in my vest, which are really roses, are much weightier design elements than the “X”s. Furthermore, there are only 3 rows of them that line up in the buttoned section. So, if you shifted things over to fit in (or remove) a repeat, you’d end up with one side of the button placket having two heavy roses and one light X; the other side would have two light Xs and one heavy rose. If you stared at it long enough, you’d start listing to one side, and you might even topple over. We could be causing accidents all over the place! And, oh yeah, it wouldn’t be symmetrical. By now, I suspect you all know how I feel about symmetry, right? 1) For a perfectly symmetrical OXO design, whether the motifs are staggered or stacked, use an EVEN number of repeats and CENTER them, so that either an X or an O is split at the front, at both sides and in the back. 2) For a potentially aesthetically symmetrical OXO design, you might get away with using an ODD number of repeats and staggering them, splitting either an X or an O at the sides and having whole Xs meet whole Os at the front, but don’t try this unless you have enough vertical repeats to create a well-distributed, staggered effect. 3) Remember, these are guidelines, not rules. There are no rules in knitting! While beloved traditions and strong opinions abound, the best advances come from breaking the “rules” set by those traditions and opinions. Psst – did I mention that the swirls in the center of roses are not symmetrical? For more of my designs, symmetrical and otherwise, click here. If you’re wondering “Where in the world did she find such a handsome wombat! ?”, look here. 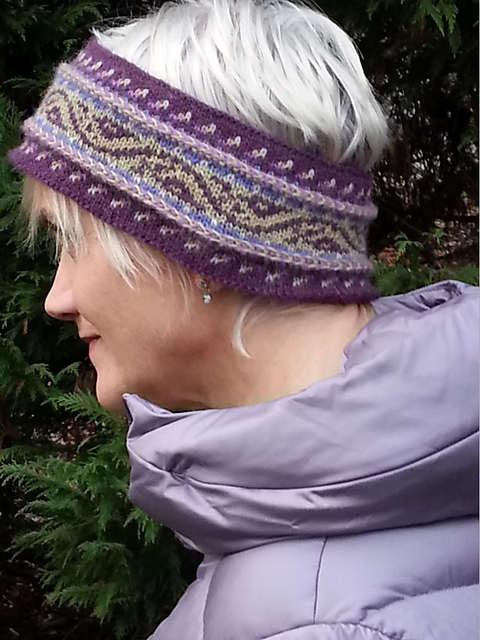 This entry was posted in Knitting, Mary Ann's Designs, Technique and tagged Dale of Norway, design, design layout, fair isle, fair isle knitting, Knitting, knitting design, motif layout, number of repeats, pattern, pattern repeats, repeats. Bookmark the permalink. Part of the problem with Vogue’s version of Oregon is that the armholes were brought forward. Strange, but the body was not dissected into 4 equal sections, like you show in your diagrams. Hi Marina! Yep, I saw that, too – for instance, on the 1st size, 3 sts shy of the side “seam” st, they had you place 11 sts on a holder for the armhole base. So, to the front side of the central side st, you’d have 3 sts, then, going towards the back, past the central side st, you’d have 7 sts. Not good. It’s no secret that misprints can occur, so hopefully, rather than following the Vogue instructions verbatim, some folks saw the obvious midline in the motifs for the armhole placement and placed their steeks symmetrically around those points. But even if they did that, the odd numbered repeat sizes would still be doomed to those mismatches at the shoulders. But in AS’s original verion, Oregon remains one of my favorites. Am I on a hopeless chase…looking for a “Fair Isle” pattern or motif that can be manipulated on a top down raglan sweater at the sleeve increases so that the motif won’t look bizzare and the sweater look homemade. I’m looking at using 2 strands of Kauni for the colorwork. “Thomasean”, as long as you place the center of your motif on each side (faux) seam and as long as your increases are symmetrical on each side of those side seams, your top-down Fair Isle raglan stands a good chance of being magnificent! Thanks so much for the tutorial. You saved me from an odd number chart disaster on my resized Rosecalie. I can now cast on without fear. The most significant point, from a knitter’s perspective, is that an odd-numbered repeat will leave you with different motifs that do not line up well at both the sides and the shoulders. Thanks for sharing your mitten pattern. I am a little “wow-ed” by your understanding of the pattern placement on your vest illustrations………this is why I am the knitter of items that other smart people design……Keep up the good work!